Slayn: [Slayn conjures a spell against attacking gargoyles] Omnipotent power, creator of all things, forged by the gods from eternal chaos, throw off these false garments and reveal thy true forms. Creators of all things, become a shield to protect me. Great protectors, do not allow those who would destroy your great works to do their bidding in this sacred place. Use me as your weapon against this evil. "I don't understand you humans at all... I guess that's what makes you so fascinating." 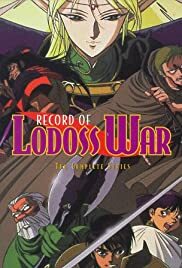 Record of Lodoss War is one of the greatest anime series of all-time (Well the OAV version). The presentation was done so well and the work has been put into it was outstanding. The characters were absolutely the best part of the entire series. Each of their emotions were done elaborately and thoughtfully while not straying far from the story. Who also can forget the awesome character designs of people. Such people as Deedlit, the high elf or Ashram, the Dark Knight. The only thing that's bad is it's only 13 episodes, and you wonder what will happen after the last one. As far as I'm also concerned the dub is just as good as the sub too. Nonetheless it's a great anime to buy on DVD, and while you're at it get the new TV series on it on video.